Jessup’s third-place prize includes a $2,500 award, along with a Feb. 2-4 all-expenses-paid trip to New York City, where she and three other winners will be honored at a luncheon. One of four Center for Service-Learning volunteer fellows who support and encourage community service at Bates, Jessup serves as a board member for the Central Maine Adaptive Sports (CMAS), a non-profit, community-based recreation and sports program for children and adults with disabilities. 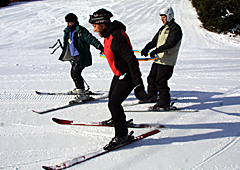 Jessup also participates in the program as an instructor for disabled skiers at Lost Valley in Auburn and serves as a liaison between CMAS/Lost Valley and Bates by informing students of volunteer opportunities. Her efforts yielded 10 Bates coaches. “Despite her busy academic schedule, Lori has not been afraid to make the commitment to serve physically and mentally challenged individuals in the community in which she temporarily resides,” said Mary McNulty, CMAS president. Calling her energetic, cheerful and resourceful, McNulty cited Jessup’s problem-solving talents and creativity. A political science major with a concentration in economics, Jessup is a standout varsity athlete at Bates, where she plays lacrosse and field hockey. During her sophomore year, she led the women’s lacrosse team with 31 goals and earned Inside Lacrosse magazine’s National Division III Player of the Week honors for a 6-point performance against Williams. As a first-year field hockey starter, she led the Bates team in goals and points. She is a sports columnist for the campus newspaper, The Bates Student. In addition to her CMAS commitments, Jessup works as a service-learning student with the Maine People’s Alliance, focusing on health care and environmental issues. The three other top 2002 “Best of You” contest winners are a doctor who provides free dental care for foster children, the director of a baseball league with specially equipped fields for physically challenged youngsters, and the founder of a non-profit legal service to end domestic violence. In partnership with the cosmetics firm Sally Hansen, Glamour invited readers of their June 2002 issue to submit 100-words descriptions of “how they use the best in themselves to bring out the best in others.” Contest judges considered an entrant’s inspirational qualities and scope of accomplishments.